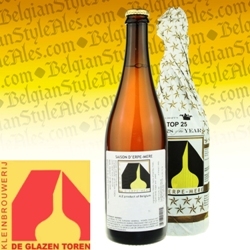 Introduced in 2004, and the very first ale produced by De Glazen Toren Brewery, Saison d'Erpe-Mere is a modern saison brewed using traditional methods and all-natural ingredients including artesian water, malt, hops, yeast and liquid candy sugar. Top fermented and bottle conditioned, the ale pours pale blonde with a frothy white head. Aromas include citrus, banana, peach and spice. Taste follows the nose and includes mild citrus sweetness with notes of floral, apple, and yeast as well as a nice bite of bitter hops. The mouthfeel is medium-bodied and creamy smooth – helped along by lively carbonation – while the finish is tart, dry and bitter. This Saison is very good paired with curried dishes or with fish, and will also enhance your enjoyment of earthy style cheeses such as Camembert and Fontina or nutty style cheeses such as Asiago. Officially founded in 2004 in the town of Erpe-Mere in the East Flanders region of Belgium, De Glazen Toren Brewery had its origins in 1988 when Erpe-Mere bureaucrats Jef Van Den Steen, a mathematician and town alderman, and Dirk De Pauw, a lawyer and the newly appointed town clerk, met and discovered a shared passion for beer. They became friends and then hobby brewers. 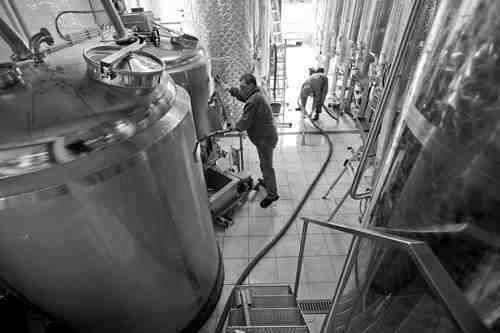 Their initial experiments in 50 liter batch brews were unremarkable, and the pair realized that enthusiasm was no substitute for craft or expertise, so they enrolled in a three year course of brewing studies and training at the CTL Institute in Ghent. It proved a wise decision. The quality of their experimental brews improved spectacularly, so much so that they committed to opening their own small brewery. 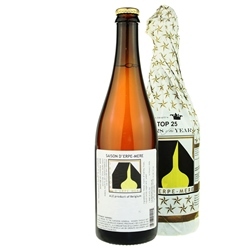 Today, with the addition of a third partner, Mark De Neef, De Glazen Toren Brewery exports all-natural, high quality ales to at least nine different countries including the United States, Canada, Italy, Australia, and Japan.